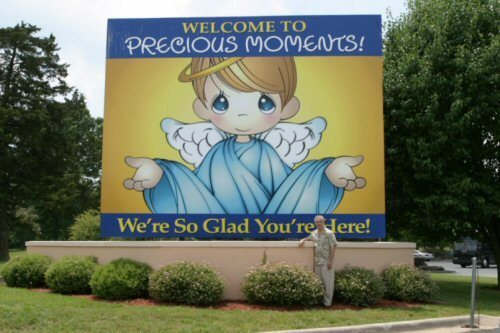 The Precious Moments Chapel in Carthage, Missouri, is the creation of artist Samuel J. Butcher as a gift of thanks to God; recognizing the many blessings given by God. The Chapel has often been described as “America’s Sistine Chapel” as an artful representation of Michelangelo’s own Sistine Chapel in Rome. The Precious Moments Chapel welcomes thousands of visitors annually, offering FREE Chapel tours daily. The Chapel grounds include an inviting Visitor Center, Gift Shoppe, Royal Delights Cafe, and beautifully manicured gardens adorned with bronze statues and fountains. The Visitor Center is the home to the world’s largest Precious Moments Gift Shoppe, as well as Chapel Exclusive figurines. The Precious Moments Supporting Foundation continues to offer FREE Chapel tours and FREE admission.